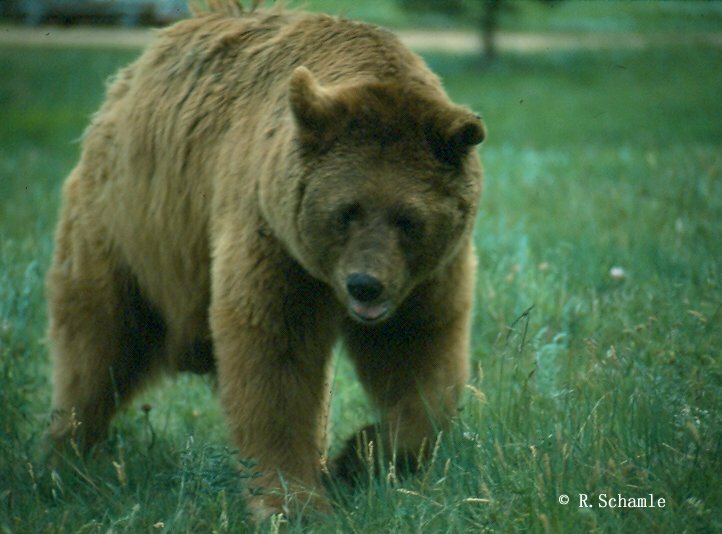 Despite my many years living in Alberta’s wilderness, I would have considered it a rare privilege to actually have encountered a grizzly bear in the wild. Black bears I have encountered many. This was in the summer of 1976, the year of America’s Bi-Centennial celebrations. I had just graduated in December of 1975 from Syracuse University, New York State. And taken the time off to travel extensively that summer with my little boy, eight years old, in our old square back VW van – a really old model. I called it our ‘Hobomobile’, as it served also as our home for many weeks. By Fall of that year we went up north into Canada, before the cold set in. Shortly after we arrived in Alberta in 1976, I got myself work. Then from January 1977 until into the 1990s working in Alberta’s oil industry. From 1978 on until the year 2002 I mostly lived by myself – after also my son left for the USA in 1990 do do his graduate studies in Alabama – in the Foothills of the Rocky Mountains in Alberta. Surrounded by wild life. Because all those many years I had horses, I also had large pieces of land. Mostly wilderness, treed. After nine years in the Kananaskis country south west of Calgary, during the 1980s, several times with a group of other riders and the horses, we made overnight trips for several days to Two Jack Lake, Lake Minnewanka, Banff National Park area. Because this is so high up, this is also prime Grizzly bear country. For several days we camped out in large Army tents, the entire compound surrounded by electrified barb wire, against bear visits. During those years I also had 160 acres of bare land far outside West of Cochrane, (north up Forestry Trunk Road, north of the (today Ghost River Dam area)). [ https://www.cottageclub.ca/history ]. This was so far out, surrounded by miles of Crown land, that there were no real neighbours. I made very many rides with my horses alone in this wilderness area high up in the Rocky Mountain Foothills, but never once came face to face with a grizzly bear. They are there, they can hear you, they can smell you. I can see traces of them. Besides that rarely would any bear or wolf or any wild animals attack a human, when going out alone in those areas, always make some noise, make yourself heard. This 160 acres by the way was close to the Stoney Indian Reserve. [ http://www.rockymountainnakoda.com/our-lands ]. My most precious book: These Mountains are our Sacred Places. The Story of the Stoney People. 1977. By Chief John Snow, of the Wesley Band. Surrounded by hundreds of acres of Crown land. Often during those years I had to visit a saw mill somewhere in the middle of nowhere to pick up my rails for making my horse fences. There were no roads. This could only be done by a heavy 4×4 truck. One day I drove in to see that guy who operated the mill. On my way in, a couple of guys in a truck came out, white as sheets in their faces. I thought they saw a ghost. They told me that there is a grizzly bear who had taken down a cow and still in there, feeding. I drove on, passing by some yellow Dept. Forestry tape – WARNING BEAR – then on to the sawmill. No one there. Pretty eerie. Again the bear nearby, but not visible. That’s as much as goes for grizzly bears. They are there, but cannot be seen. If you run into one unexpected, though, you better be careful ! Since 2002 residing in British Columbia, where Grizzlies and their sub-species – the Pacific Rain Forest white Spirit Bear – can hopefully be seen by sailing up the BC coast north Vancouver Island. Which I did in 2014, stopping various times during the sailing thru the Johnson strait. One of my videos during a storm [ https://www.youtube.com/watch?v=UIVhEkGRiN8 ] . Grizzlies hunting for salmon – we did not see. [ https://renataveritashistory.com/2014/10/25/adventure-sailing-trip-northern-vancouver-island/ ]. NOTES. Links to earlier articles on grizzly bear hunt. Twenty seven years I spent in Alberta, north west of Calgary in the foothills of the Rocky Mountains as well as south west in the Kananaskis country [ http://www.kananaskis.com/ ]. Despite the cold winters, Alberta for me is still the most beautiful of Canada’s provinces. The landscape east of Calgary coming from Saskatchewan is rather flat and undulating, towards the mighty Rockies wide open skies and those wonderful mountains are a sight to behold. It is easy to imagine that the temperature during already cold winters is always at least ten degrees colder outside the cities. North west of Cochrane (which is the next town west from Calgary) I had snow up to five feet at times. The same when we lived almost ten years in Bragg Creek, a small hamlet south west of Calgary [ http://www.braggcreek.ca/ ], the snow was so high that I had to pull my old Dodge truck with my car over the acreage across the snow using my lariat, in order to be able to go to work in Calgary. Every morning up at 6 AM, driving down town to Calgary. When a blizzard hit the city, it had been impossible to drive home after work. I tried once, took me 3 hours slowly for twenty km. No heating in my car either. When working up north on contracts, I needed to drive every weekend between Millarville [ http://en.wikipedia.org/wiki/Millarville ] from my large acreage to downtown Edmonton. Friday after work down and Sunday night back. Many times during that winter I was the only driver coming out of Edmonton and driving south. We called this – highway No. 2 – the ‘killer highway’ because of the many accidents occurring during iced up winter roads. I counted at times at least fifty vehicles upside down and inside out in the ditches. Driving slowly, I made it. My ranch near Millarville was steep uphill, a quarter of a mile to the house, walking and leaving the car in front of my gate. Once my front door was frozen, I had to break in else to face freezing to death. How did we survive ? As the saying goes: “There is no such thing as a cold winter, only bad clothing.” We wore arctic clothing and heavily padded overalls – like worn in the oil fields. Long underwear of course and heavy gloves and high padded boots. I had been in Fort McMurray as well working temporary for Suncor oil company in 1987. In winter. [ http://www.suncor.com/default.aspx ]. Lucky for all of us contractors, it did not last long, as one of their buildings blew up and all contractors had to leave. Today, living by the Pacific Coast, and warmer climes, I could not take that cold anymore. When going on a trip meeting diverse people if often happens that the stories turn to guns. This being an ‘iffy’ subject, it is usually not wise to talk too much about my own gun stories in the presence of the ladies. Years in Alberta will teach anybody in the country a bit about the long rifle. We all had them. Hunting moose and deer in winter, and shooting grouse in fall for Thanksgiving. Shotgun, hunting rifle, 22 and more. [That was all legal at that time, in conjunction with an FAC = Firearms Acquisition Certificate, and a wildlife license for hunting.] In between the periods of the Canadian Gun registry program [ http://www.rcmp-grc.gc.ca/cfp-pcaf/online_en-ligne/reg_enr-eng.htm ] . I still believe that the Province of Alberta brought down that (terribly expensive) gun registry program. My long rifles from Alberta ending up on the coast here, and all legally sold to a gunsmith in the Highlands. Myself, am collecting antiques and collectors items now, wherever I travel. 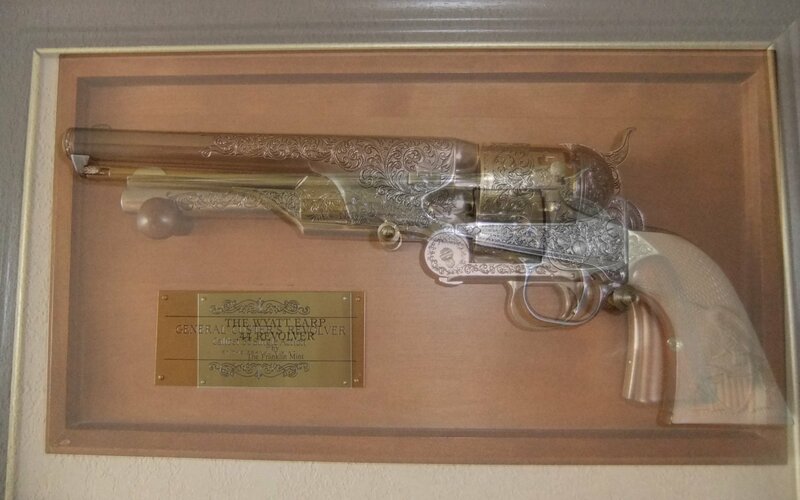 My favorites from the Franklin Mint Collectors Society: Exact re-creations of the Wyatt Earp .44 Smith & Wesson Revolver; and General Custer’s Colt .36 Model 1861 Navy Revolver. Both of these modified, so that they cannot chamber ammo. Present regulations [ http://www.rcmp-grc.gc.ca/cfp-pcaf/form-formulaire/index-eng.htm ]. During the many years living in Alberta’s wilderness outside of the big cities of Calgary and Edmonton, along the foothills of the Rocky Mountains NW of Calgary, I have encountered situations which to most city dwellers may seem frightening. During the years I worked on my 80-acre ranch with my horses, building barns and rail fences. Adjacent to my acreage was crown land, miles of it, leased out as grazing land to the big ranchers for their cows. Somewhere in the midst of all that wilderness – grass and many trees – was that saw mill. I often went to the saw mill to get rough cut lumber, using my 3/4 ton 4-wheel drive Dodge truck. There were no roads, only rough rutted trails. One day driving in there, a smaller truck came out towards me, two men sitting in it, cheesy-white in their faces, obviously scared of something they encountered in the vicinity of that saw mill. Indeed – when I came closer I saw the yellow warning tapes from Alberta Wildlife around a larger area (grizzly bear), right close to the saw mill. I drove on to see the saw mill guy. He was not around. Obviously because of the grizzly bear warning. Later I read up on this in one of the local papers. A grizzly had taken down a cow. Scary ? well, not really. Just always be careful and do not aggravate such large wild animals without first announcing your presence. In that case, though, being a big bear feeding, an even more careful approach is needed. 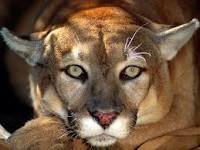 The American cougar (or mountain lion, puma, or mountain cat) is a fairly large cat, weight of a male up to 100kg, a female up to 60kg. This animal’s range is rather large, from North America, Canada West down to Mexico and the most southern ranges of South America. Making it one of the smartest predatory big cats, who are not on the brink of extinction. They can live in cold, snow, and in hot climates. Mostly prefer rocky areas, where they can hide and stalk while the prey is roaming on a lower plain. Attacks encountered and witnessed when in Alberta, Kananaskis Country West of Calgary. We went riding in the Foothills. And a cougar does what it does best, ambush and jump from the top of a rock or cliff. Jumped on the horse, that of course bolted away in terror, threw the lady rider (lucky she was) and seriously injured that horse. I saw it, its skin was shredded. I did a lot of solo riding (twenty seven years) in the Foothills of Alberta. Always look up in addition to look ahead and down for signs of cougar or grizzly bear. On my 80-acre ranch in the Alberta Rockies I had cougars on my land. Maybe I had been lucky. Went around them, when finding a deer kill site. Retreat and get out of there. Why many cougars on Vancouver Island ? Because it is an island, because it is rocky (volcanic rock), high rocks. I love these cats. But also realize they can be close anywhere where I cycle on the trails outside the city. Usually the cougar does not attack a person, but can and may when opportunity knocks or because of inexperience (especially young cougars), or when confronted. Vancouver Island cougars are a bit different. Less area, more conflict with people, and they cannot leave this island ? Not quite true – a cougar can swim [ http://o.canada.com/2013/07/24/swimming-cougar-vancouver-island/ ]. More than two thirds of North American fatalities occurred on Vancouver Island. Incidences here include: young cougars wandering into the Victoria Empress Hotel (tourists terrified – animals terrified). One lady told me she went swimming in the surrounding ocean, on her return to the beach, that big yellow cat was there looking at her. There is lots of deer (the cougars’ staple prey), but sometimes they take pets, and they can be dangerous to children.